The Glove. Called The “Holy Grail” of MJ collectibles by auction dealer Darren Julien, this HIStoric glove was worn by Michael during his legendary “Billie Jean” performance on “Motown 25: Yesterday, Today, Forever”. The NBC television special, featuring a “Who’s Who” of Motown acts, was taped in front of a live studio audience on March 25th, 1983. It was broadcast on May 16th, where it was seen by an American audience of almost 50 million people. The special marked the “reunion” of the original Jackson 5, which had not performed together (with brother Jermaine) since 1976. 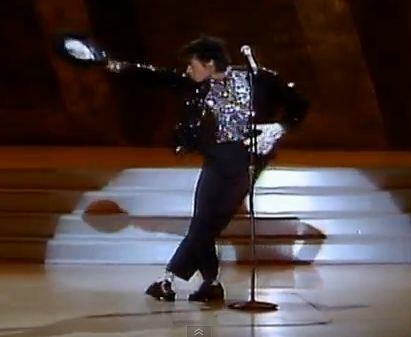 But the electrifying performance that night that literally changed HIStory…was Billie Jean. In fact, it was the indelible significance of what took place that evening which made The Glove itself so iconic from that very moment onward. Even though Michael performed this song live hundreds of times after that performance, nothing could match the raw ENERGY and emotion displayed on that particular night. From the moment he reached down to pick up that hat…swooping it onto his head in a single motion, the POSE, pelvic thrusts, a quick look behind him, hand on knee, hand on knee, hands out, hands out, throwing the hat, POSE. No matter how many times we’ve seen this performance since, the intensity and emotion on display that evening leaves us mesmerized, and the irresistible urge to watch it again...and again. 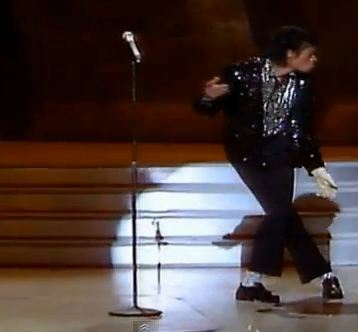 Undoubtedly the most memorable part of the performance was his public debut of the moonwalk, which would instantly become Michael Jackson’s signature dance. 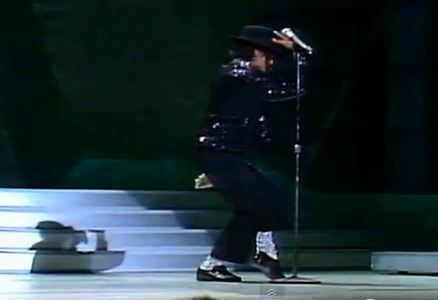 Certainly, Michael’s later performances of Billie Jean (on tour and on TV) are much more technically sound, and more polished than “Motown 25”. 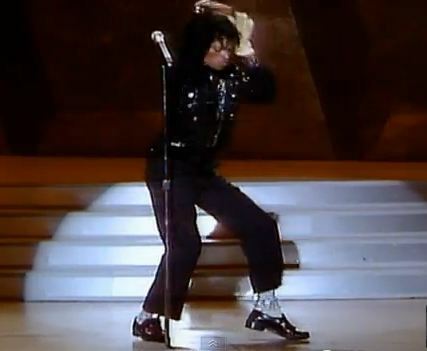 And indeed, Michael’s live concerts all included a stellar and extended “spotlight only” routine to the distinct beats of drummer “Sugarfoot” Moffett. However, nothing can compare to the magic of that singular night in 1983, and the passion exuding through Michael’s eyes, face, and body could never be matched again…even by a perfectionist like MJ. 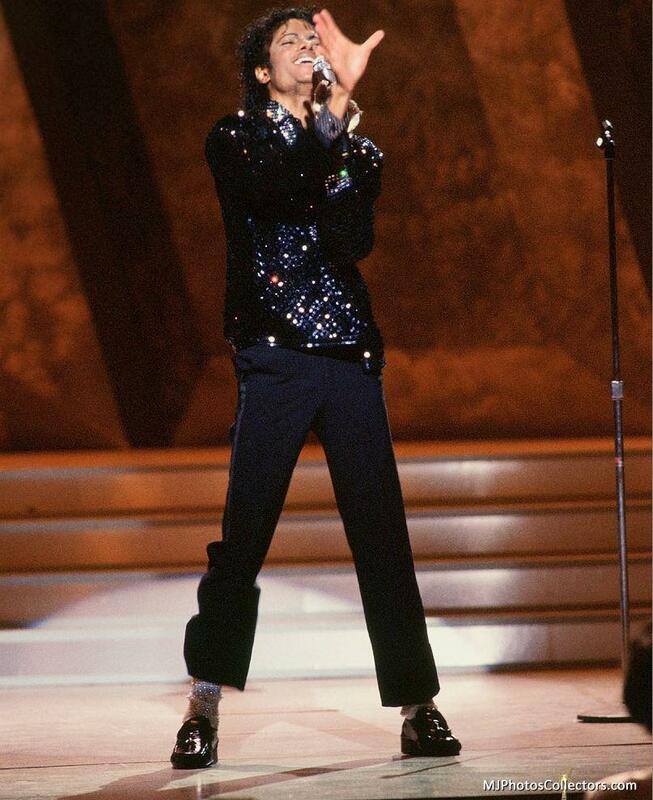 “Motown 25” was a coronation which catapulted Michael Jackson to the world's consciousness like never before. Many of the 50 million people who watched that performance bought Thriller in the coming months, keeping it #1 on the Billboard charts for an unprecedented 37 weeks, soon making it the biggest selling album of all time. Michael’s appeal transcended race, gender, age, religion...and had everyone from professional dancers to young school children mimicking his dance moves and the way he dressed. And at the very center of that “look” was…The Glove. 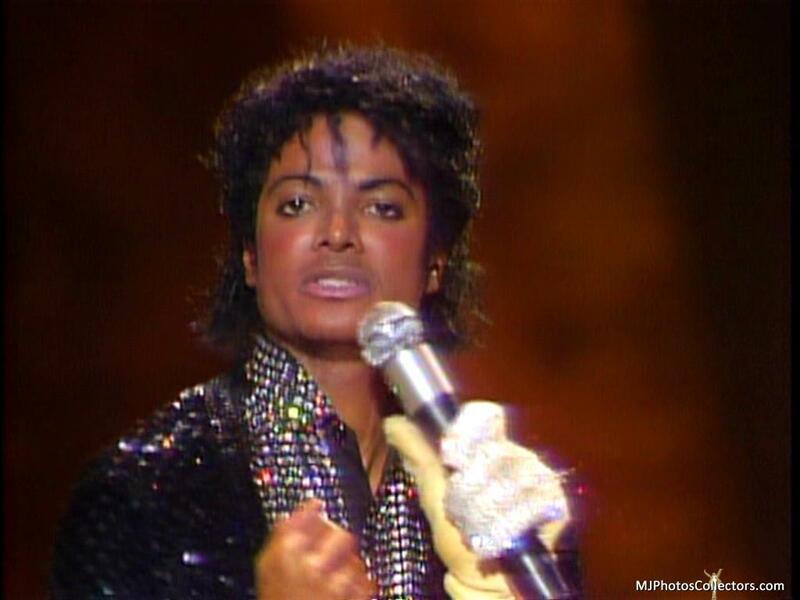 That “look” was something that became known as Michael’s trademark. 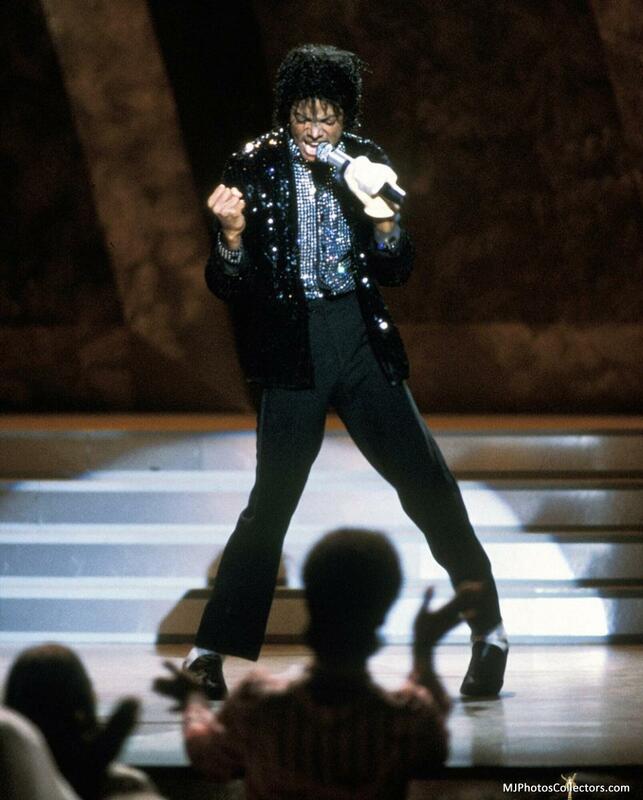 And, even though he had been wearing it for years, the single glove, along with the matching socks, the sequin jacket, and the black fedora worn on Motown 25 instantly became identifiable as Michael Jackson’s magical persona. And for that very reason, The Glove worn on that night has a historical significance within Pop Culture perhaps rivaled only by Dorothy’s “ruby red” slippers. 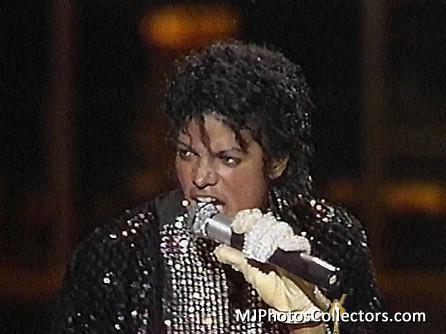 The sequin glove worn on the Motown 25 special is significantly different from the other gloves Michael had worn before or since. 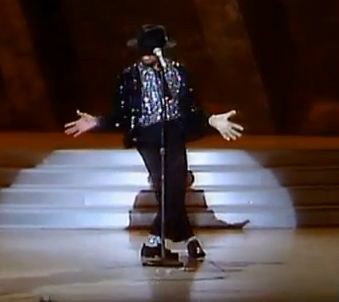 Previously, Michael most often wore his glove on the right hand. 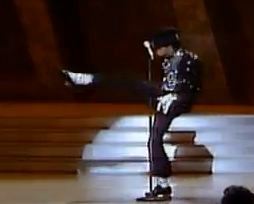 Starting with this performance, he almost always wore the glove on his left hand. Presumably, this freed his right hand to do other dance choreography (pointing, throwing his hat, removing an (imaginary) comb from his back pocket and combing his hair, etc. ), as well as holding the microphone. Apparently made in a hurried fashion, (not unlike the spontaneity and last minute creation of the performance itself) it is made using a cream leather golfing glove with an interior label reading “Made In Korea.” The Glove has an adjustable Velcro flap on the back of the hand with a single white snap at the back of the wrist. 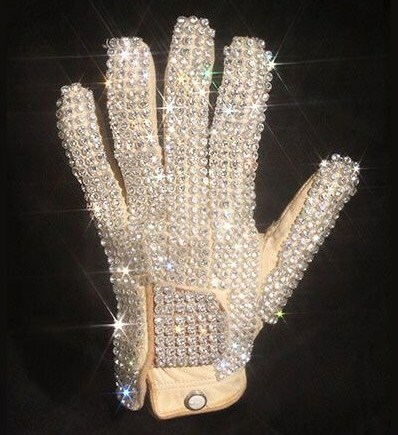 Other gloves from this era (as made by costumer Bill Whitten) were covered with individually hand-sewn Swarovski crystals, a meticulous and time-consuming process. However, this glove uses a mesh “web” of faceted rhinestones, hand cut to the glove’s shape. These rhinestone strips have been whip stitched to the back of the glove. 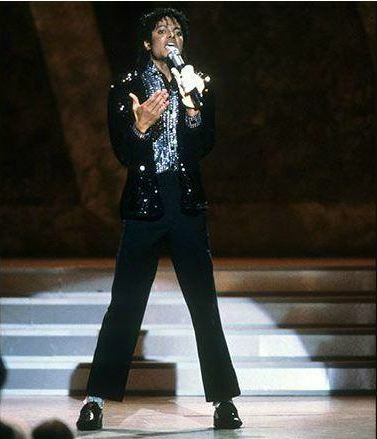 Rhinestones are completely absent on the palm of the glove (presumably on purpose in this instance, to allow Michael to alternately and easily hold the microphone in his gloved hand). Following his performance that evening, Michael gifted The Glove to long time friend Walter "Clyde" Orange, one of the founding members of the Commodores. Orange knew Michael Jackson and his family since the Summer of 1971 when the Commodores toured with the Jackson 5 as their opening act. In November of 2009, Orange commissioned The Glove to Julien’s Auctions, and it sold for a then record $420,000 at Julien’s 2009 Music Icons auction. The Glove is now on display at the MJ Gallery At Ponte 16 in Macau. For more detail on this glove and the auction of it, view our memorabilia listing here. To see more personally owned and worn MJ clothing memorabilia, click here. 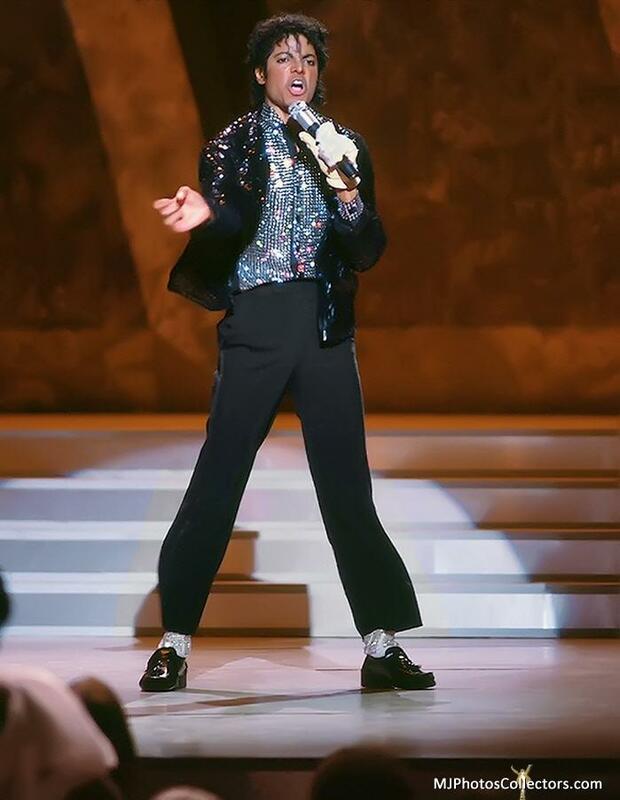 Photos from “Motown 25” provided courtesy of www.MJPhotosCollectors.com. 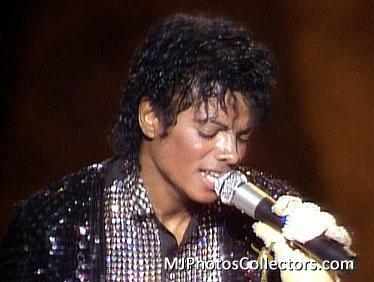 For additional photos from Motown 25, click here. Rare Withdrawn E.T. (Extra Terrestrial) LP Vinyl Special Edition Box Set. 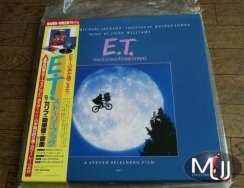 This box set comes with Japanese Obi strip and includes a 7 track LP vinyl record, a Japanese 8 page booklet with tests and info in Japanese, a 24 page color booklet featuring stills from the film, script excerpts, lyrics and credits, plus a fold-out large glossy poster with Michael and E.T. The E.T. Storybook...PLUS Someone In The Dark! !